I refused to try Naked palettes for a long time. They seemed overpriced and like the shades were all too similar to be very useful. In May of 2014, I was graduating from law school and my best friend Adiel came to visit. She had the Naked 3 with her and I asked if I could try it, just for fun. 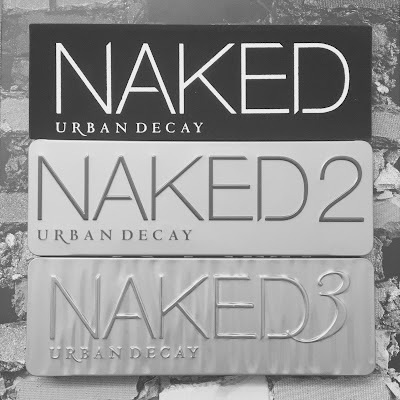 Long story short: I now own Naked, Naked 2, Naked 3, and Naked Smoky. They're my nearly-exclusive source for eyeshadow each day. And the Naked 3, which might on first glance seem to be the least versatile (it is, after all, 12 shades of pink), is the one I use the most. That's what makes the Naked 3 this week's Monday Must-have! But guess what. If you've been putting off trying a Naked palette, or if maybe you just need one more to complete your collection, today is your lucky day! I've teamed up with Adiel to celebrate the redesign of my blog and the recent launch of her blog, Rose Gold Lining. We're giving away one Naked palette of your choice. Go check out her blog, explore your different options for entry, and decide which palette you'll choose if you win! So pretty! What a super palette! I love your blog and Adiel's too! Thanks for the fabulous giveaway! Congratulations on launching your blog! Entered and can't wait to see who will win! I Cried For This Eyeshadow Palette For Christmas & Still Didn't Get It. I Wanted It So Bad Too, Because I've Gotten So Great At Makeup. I love UD!!!!! Especially the NAKED pallets!